Summary: Baw wet‑sanded the forward half of the port topsides through 2000, and it's looking very nice. But the aft half of port topsides needed to get rough sanded and re‑sprayed, as it was a bit translucent. The starboard topsides were wet‑sanded up through 1000 and then all the many little pin‑holes were filled with dots of gelcoat. The insides of the hulls and under the bridge‑deck were filled and faired and prepared for gelcoat. The trampolines were dug out, suspended where they'll eventually go, and holes were drilled in the support tubes for the lashings. The holes were then opened up into nicely rounded vertical slots, but we noticed that the rods that Golf put in there are too short. 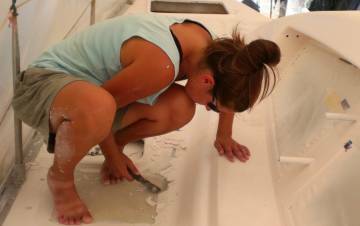 Amanda found that she could chip off some of the gelcoat up on deck. It obviously isn't adhering properly and will also have to be re‑sprayed. 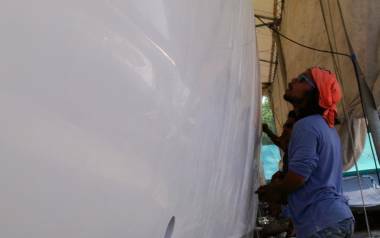 We finished rough‑polishing the corrosion out of the port side of the mast and started polishing it. 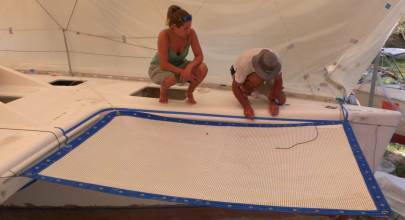 Houa built the new bed for the port aft cabin, complete with opening hatches, and coated it all with epoxy. Then he bought sheets of rubber and foam to build sound and thermal insulation to go under both aft bunks. Our life‑rings were taken to Rolly Tasker to get recovered. Unfortunately, Sue broke her wrist jumping off a drum and it will be in a cast for a month. 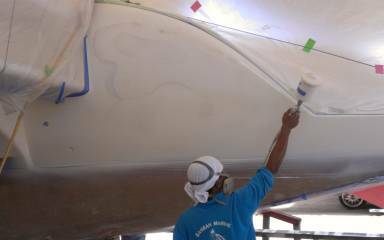 The good news is that Mike and P'Wat sprayed gelcoat on the port aft topsides as well as the entire area between the hulls! The guys immediately started sanding the new gelcoat before it got too hard. 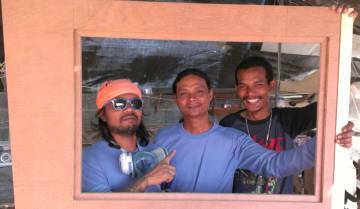 A hash‑pipe was found in our work area, and Jack and Chai were moved to other projects in the yard and we got 2 new workers, Beng and Nai. Hello Monday! All is same same here in Thailand. Hot and sunny. It was a sort of slow day at the yard, though things did move. Yoong and Jack took the day off, without explanation. Everyone assures us they will be in tomorrow, with the assumption that they just partied a bit too hearty on Sunday. This seems to be a very "Thai worker" sort of attitude towards work. Baw and Lek worked on the forward half of the port topsides, getting it all beautifully wet sanded up through 600, 1000, 1500 and 2000 grit sandpaper. Baw is asking permission to polish it, and although we would sort of rather wait to do the whole boat at the same time, we realize that the workers REALLY want to see a finished section, so he will probably get to satisfy that need! It's even attracting the interest of other workers at the yard, as it looks MUCH better than paint. Pla dedicated his day to the details of the area under the bridge deck. He put more filler on and then hand‑ and finger‑sanded around the emergency hatches. Chai and Nut worked on the very aft deck around the storage areas, dabbing bits of gelcoat over already sprayed gelcoat, or putting in filler and then sanding it all. Amanda had the dubious pleasure of un‑doing some of the gelcoat on port deck. It is now very apparent that too much time went by between the preparation of the portside deck and the actual spraying of gelcoat. Mike and the AME team noticed the problem on starboard deck last week which, unlike port, had not been plastic wrapped as soon as the preparations were finished. So they spent an hour re‑sanding and then re‑cleaning starboard with acetone to be really sure the gelcoat would stick. And most of it did. Some of what Amanda was able to scrape up on port deck is actually in areas that will be under the new nonskid, but not all of it. 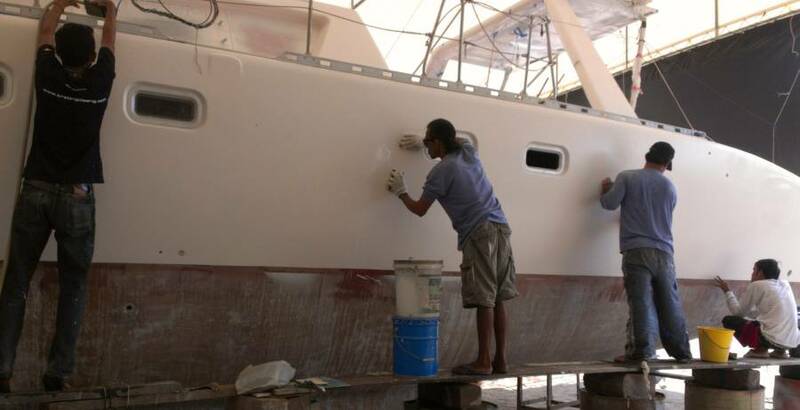 We will have to schedule time for rough sanding and re‑spraying gelcoat on the perimeter of many of the deck hatches. Grrrrr. Hate the feeling of going backwards. But in truth, it's much better to discover these problems now, not a few months down the line when we're far from Phuket! 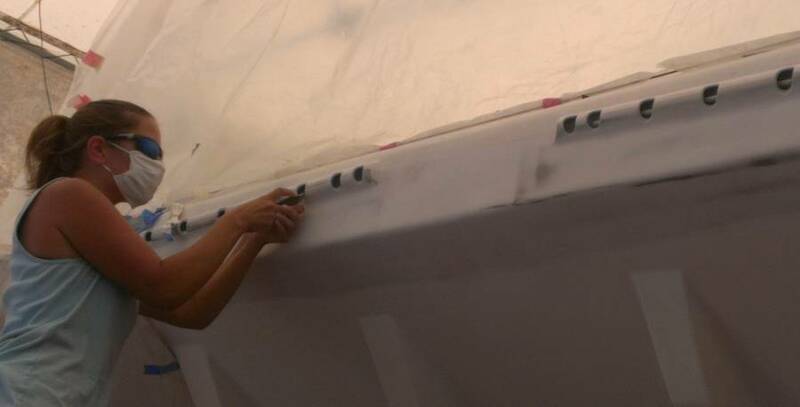 Sue re‑attacked the mast with the rough polisher, working on getting the old paint and primer off the very edge of the aluminum next to the sail track. A very painstaking and messy job as the aluminum bits fly off in many directions. We protect the anodized sail track with a strip of formica taped on so that the grinder edge meets formica, not sail track. Houa got a couple nice frames and hatch covers made for the port aft bunk. Tomorrow he can begin pulling the insulation (2 layers of foam, and 2 pieces of dense rubber mat) off the old hatches over the engine, and under the aft bunks. We may be able to salvage the rubber matting as it is quite indestructible, but the foam has to go. 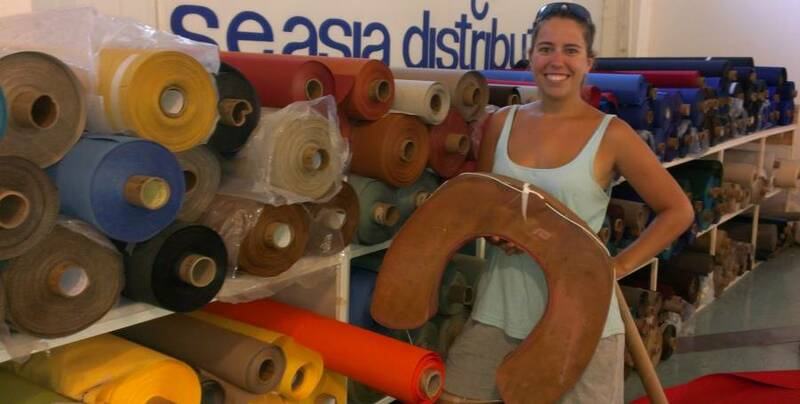 Jon consulted with Houa about what materials are available here in Thailand to replace the sound insulation under the aft bunks and around the two diesel engine rooms. Normal sound insulation is usually pretty heavy, and the good stuff actually has sheets of lead embedded in it. Houa had found a very light layered foam with foil on the outsides, which comes in 1" (25mm) and lesser thicknesses. Jon is concerned it seems more like heat insulation than sound insulation. Houa found a piece of very dense closed cell foam/rubber about 1" (25mm) thick which might work. Jon spent the morning in Phuket town and hit about 4 shops and boat yards searching for the right materials. Houa will ask around again tomorrow on his way to work. The jury is still out on what material to use. Our full team of 8 was at the yard today, and things moved along nicely. With the expectation that Mike from AME would be spraying gelcoat tomorrow, we had Baw, Pla and Nut busy with final touch‑ups under the bridge‑deck. That involved a few more areas of finger sanding, and the application of a few dit‑dots of gelcoat to fill little pinholes in the Thai white gelcoat back on port sugar‑scoop. 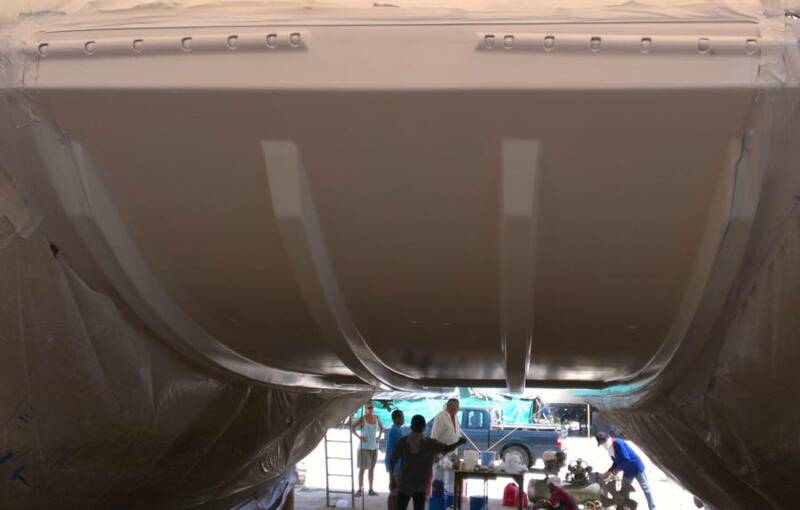 The guys also put a lot of time into carefully masking the areas of the boat that don't want to be over‑sprayed, including our shiny port topsides! Chai, Jack, Yoong and Lek worked on starboard topsides, using water and 360 sandpaper to smooth it out enough to find the inevitable tiny holes. Then they acetoned and repaired the dozens of little pinholes and bug‑marks from the gelcoat spraying. The beauty of gelcoat is that when, not if, bugs fly into the wet gelcoat, or a bit of dust or water hits the un‑gelled surface, it can be repaired easily! They just sand it rough, clean the spots, and apply touches of gelcoat by stick or plastic paddle. Those spots now stand proud, but they can be easily sanded down to match the rest of the surface tomorrow. Then the whole surface can be sanded with finer and finer sandpaper until it's mirror smooth. 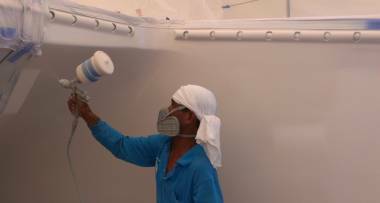 Houa kept busy epoxying his new bunk hatches and bunk platforms. He is also our very trusty man‑of‑all‑tools. He gets pulled off his own projects for probably an hour a day to do small jobs for us. Today he cut more strips of plastic for Sue to use on the mast to protect the sail track from the grinder. He helped Jon sort out options for insulation for the engine room, and super‑glued a couple rotating sanding tools for Jon. Amanda was the Scooter Queen today, running errands for sandpaper, plastic sheeting, blue tape, and a bank run for Sue. When she wasn't out and about she was on deck scraping back the non‑sticking gelcoat (still). Then she and Jon took on the trampoline project. With the imminent spraying of gelcoat on the inner hulls, we realized we didn't yet have the trampoline holders ready. These used to be sections of sail‑track bolted to the insides of the bows, but they looked pretty tacky and they weren't really strong enough. 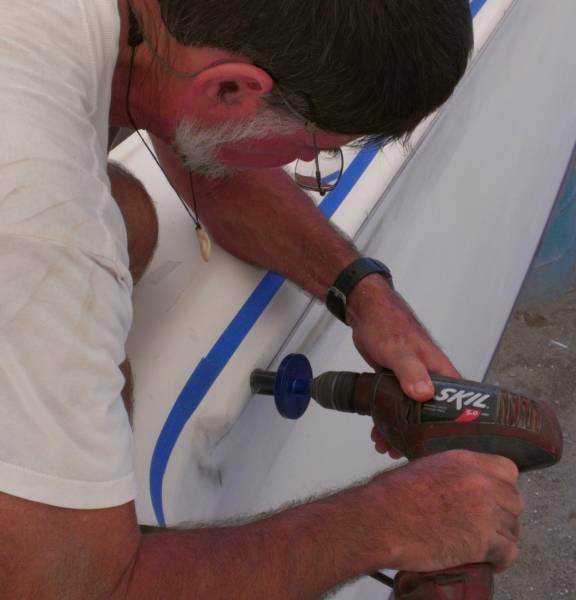 So we replaced them with sections of PVC pipe, which we split lengthwise and fiberglassed to the insides of the bows. There's a fiberglass rod inside the pipe for us to tie the trampolines to. We tied ropes to the 4 corners of one of our 2 new trampolines and hoisted and jockeyed it into approximately the right position. Then Jon marked where the holes need to go in the new trampoline holders in order to create a zig‑zag lashing pattern. We considered an out‑and‑back pattern, but that would create larger holes for tools to fall through and ankles to be twisted in. Jon used a hole saw to cut 1" (25mm) holes in the tramp holders, then put Houa's fancy cylindrical sanding tools on the drill and opened the holes further into rounded vertical slots. The final stage was the cutting out of the excess PVC in the hole, which Amanda enjoyed doing. We managed to cut about a third of the holes before the (cheap) hole‑saw completely lost all its teeth and the friction was making the PVC smoke as it cut. Yikes! In the late afternoon we heard that Mike (AME) is hung up on a job in another marina, so won't be able to make it tomorrow. Just as well, as it gives us a bit more relaxed time to finish this cutting project, and be sure we have it right before it's all gelcoated in! Sue and Amanda got to the yard early and got the guys squared away. Most of them ended up polishing the starboard topsides with 600 grit while Nut went around with a tiny pot of gelcoat and filled the many little pin‑holes. The guys also moved out most of the stuff that we had stored under Ocelot and put it under a neighboring catamaran, so Mike would have room to spray. Baw and Pla did a bit more prep‑work on the inside bows and sanding smooth the interiors of some of the through‑hull fittings, but most of the between‑hulls area is ready to be sprayed. Houa made the best progress of the day. 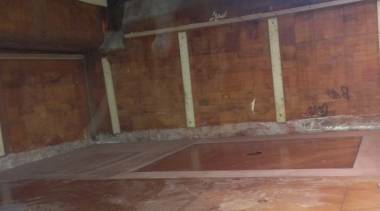 He got the bed for the port aft cabin all ready to epoxy in. He would have gotten further with it but we want to stick the sound‑proofing under the bed before we epoxy everything into place. We had our first real accident at the yard today. Sue was sitting on a drum, and when she hopped off she fell into the hole that we'd dug for the port rudder and came up with a very sore wrist. We iced it down but after a while we decided it needed more professional attention, so we borrowed EU's big diesel truck and Amanda took Sue to the Phuket International Hospital. Turns out she's got a fractured wrist. So now she's got a temporary cast on. That will come off in a week to be replaced by a more permanent cast that she'll need to keep on for another 3 weeks. Not fun, but at least she didn't need any surgery. One of the small, intervening issues was that a hash‑pipe was found stashed in the workshop. Last year we found out that one of the workers smoked at lunchtime and we told him not to. We suspect that this pipe belongs to one of the other workers. Ordinarily we wouldn't worry much about what the locals do, but if the customs officials find drugs around Ocelot, they could confiscate the whole boat, so we tend to take this sort of thing pretty seriously. Out here, they've never heard of advanced concepts like "innocent until proven guilty" or "rights of the accused" or even "due process." We'll probably turn the whole issue over to Cris, the yard manager, and let him and EU (the boss of most of our workers) work out what needs to be done. Late in the day we heard that today is Cris' birthday, but by then it was much too late to arrange anything celebratory. EU had a handful of beers that he handed around, but Cris wasn't even around for us to rib about turning into an old fart (we think he's 38 ). Hopefully we'll get a chance to do some belated celebrating soon. A spray day! These are always exciting for us. Sue decided to stay at the apartment today. Although she's feeling much better and even slept last night, she doesn't want her hand to swell up, which they often do. She hasn't been able to remove her wedding ring for several years, and if her hand swells too much, the ring may need to be cut off. So she's taking it easy. We had a bit of time in the early morning to get some last minute jobs done. 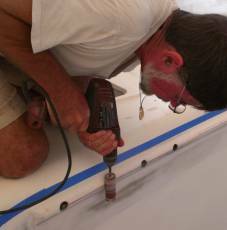 Jon ground the portside trampoline holes into slots and Amanda cleaned them up, cutting back the PVC, sanding everything smooth and putting bits of used sandpaper into the slots to protect the fiberglass rod inside from getting sprayed with gelcoat. But they couldn't get to the starboard holes in time. Baw replaced the masking that we'd had to take down up front, so it was mostly ready for Mike and his crew when they arrived. Mike and crew arrived about 10am. Jon showed Mike where we've been chipping gelcoat off the decks, where it hadn't adhered properly. Mike pointed out that poor surface preparation is the main cause of poor adhesion. This seems born out - we sanded the starboard decks just before they were sprayed and only one small area shows signs of poor adhesion. The port decks were sealed in plastic when Baw had finished preparing them, but then a week went by before they were sprayed. Port side was wiped with MEK before it was sprayed but wasn't sanded, which may be why we're having adhesion problems there. The main questions, of course, are: How do we prevent the gelcoat from peeling up in the future (probably by sanding just before spraying) and how do we make sure we've found all the problem areas that need to be repaired? That last is still an open issue. Mike decided to spray the inside of port hull, from the waterline to the first wave‑breaker on the bridge‑deck. If there was time, he'd also spray the same area on starboard. Given the above, we decided to give the area to be sprayed a quick sand with 100 grit paper, despite Baw saying it had been sanded and wiped with acetone just the day before. Better safe than sorry. It was sanded, thoroughly wiped with acetone, and Mike started spraying just after 11. The spray went pretty well except that the smaller gun never worked right. After completely stripping it and cleaning it twice, they carried on with just the big gun. This slowed things down a bit, especially since P'Wat prefers a finer spray, with less air and therefore less volume. It was also a bit inefficient having 2 sprayers and only one gun, but at least they could trade off when they got tired so the gun was in use continuously. 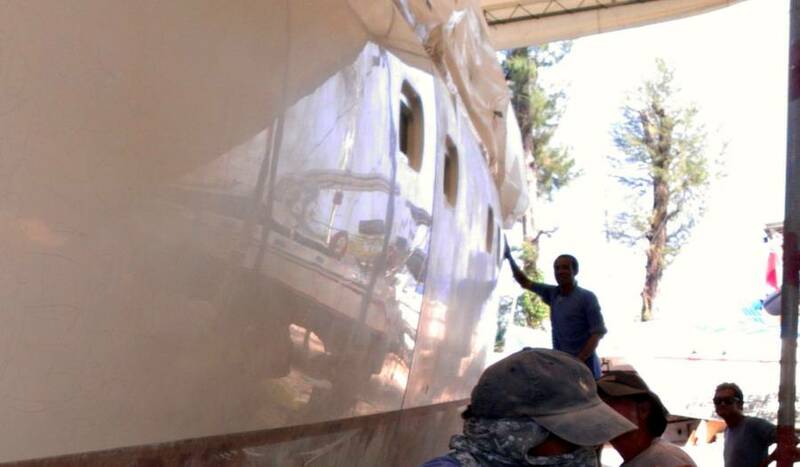 Starboard hull being sanded and starting to show reflections! It took them about 2½ hours to spray 40 lbs (18kg) of gelcoat onto the inside of the port hull. Then we took a 30 minute break to sand and acetone wipe starboard before they started again. Mike pulled a fast one on P'Wat, commenting to him that he didn't think they could finish all of starboard in time, to which P'Wat said "Sure we can!" Which locked P'Wat into fulfilling his claim (which was, we think, Mike's intention all along!) And P'Wat did finish starboard side, just before 5pm. While all this was going on, Baw and Nut were masking up the outside of the port topsides again. 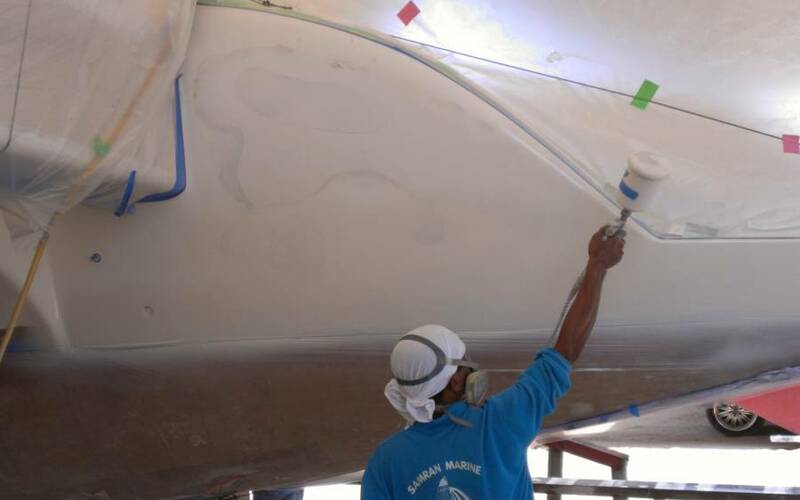 Although Mike sprayed 4kg more gelcoat on port than on starboard, we can see some artifacts through the gelcoat on port. So Mike has agreed to spray another layer on the back 2/3 of the port topsides, to increase the opacity. It has already been sanded to 400, but then it was cut back with 180 grit, to give the gelcoat more of a keyway to grab. Now it's all ready for Mike to spray tomorrow, possibly while P'Wat is spraying the underside of the bridge‑deck. The rest of the guys were wet‑sanding the starboard topsides. They started with 600 grit in the morning, then moved up to 800, and then to 1000 by late afternoon! The hull is starting to show reflections! A good day! Sue is still taking it easy in our apartment, trying to keep her hand from swelling up and enjoying the air conditioning and internet. Jon and Amanda got to the boatyard a bit late but the guys were all happily wet‑sanding the starboard topsides with 1,000 grit. We pulled some of them off that because we had a lot of work to do before Mike and his team arrived to start spraying gelcoat. 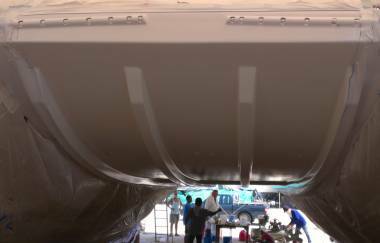 The program today was to add a bit more gelcoat to the aft 60% of the port topsides, and to spray the underside of the bridge‑deck - the area between yesterdays sprays. This meant that the masking all had to be changed around, the edges of yesterday's gelcoat had to be faired where it touched today's spray, and everywhere being sprayed today had to get a final sanding and cleaning with acetone. We let Baw direct most of this work. Jon and Amanda had another project. They wanted to finish the holes in the trampoline supports for the central area that was about to be sprayed. On their way to the boatyard they'd stopped at our favorite local hardware shop and bought some sandpaper disks for the grinder. These are bits of sandpaper glued around a central hub that fits a grinder. Jon thought it would be faster than grinding the slots with a sandpaper‑covered tube. And it was - a bit too fast, really. The powerful grinder cut through the thin fiberglass and PVC like it was warm butter. Very easy to lose concentration for an instant and ruin a lot of work, but Jon managed to open the holes into slots without any major mishaps. 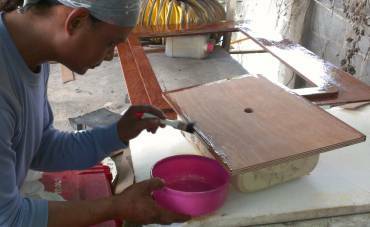 Then he used one of Houa's sandpaper‑covered tubes to finish the job, making the slots uniformly rounded and smooth, so Amanda could trim away the excess PVC and then stick bits of old sandpaper inside the holes to protect the rod within from gelcoat. A bit of a rush but we finished just in time. P'Wat started with the port flank. 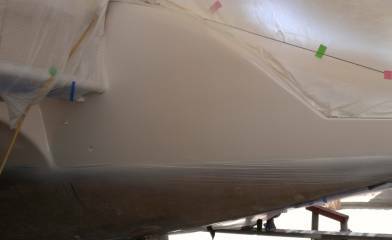 Although Mike shot more gelcoat onto this area than on starboard side, bits of it were still translucent enough that we could see vague color changes through it, like where the dark red phenolic epoxy ended against the white hull. Hopefully this extra layer of gelcoat will be completely opaque. P'Wat only put on a single layer of gelcoat so although it's a fairly large area it only took him an hour or so, from 10‑11. Given yesterday's problems with the smaller gun, Mike brought a brand new big gun, with a 4mm nozzle (about 1/6"). This let them both spray under the bridge‑deck. The AME compressor can't handle the air demands of 2 big guns, so we used our compressor as well. Our compressor is a bit bigger, and we probably could (should) have used it for both guns. Unfortunately, when ours ran out of fuel it refused to start again, but by then the job was almost finished and P'Wat could finish everything while still maintaining a wet edge. This shoot took just over 2 hours, and they were finished just before 2pm. We've been having a small labor issue in that some of the guys aren't happy with Baw being the team leader. Apparently, they feel that age (rather than commitment or time on the project) should determine the leader. So we traded Chai and Jack, 2 of our more experienced workers, to other boats in exchange for a young apprentice type, Beng. He seems to be a good friend of Nut (who is also apprentice grade) but we'll have to see if he works as hard. 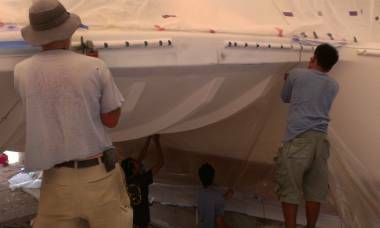 While the gelcoat spray was going on, the guys were sanding the starboard topsides and looking for tiny pin‑holes. These were opened up with a small knife and then filled with dots of gelcoat. Then they'll get sanded down to match the rest of the hull. After the shoot the guys picked up all the mountains of vinyl masking and masking tape and bagged it all to be hauled away. We now have 6 big garbage bags waiting to be hauled away. Houa was shopping for sound insulation for much of the morning. We found some stuff that had been imported from Europe, but they wanted $250 for a 3'x4' (1x1.2m) sheet. Instead we bought some 4mm rubber sheeting, some 2mm rubber sheeting, some dense 1" (25mm) foam and some lighter 1" foam with foil. We plan to make a sandwich of all 4 layers, which we hope will provide both sound and temperature insulation for the engine rooms. Houa then spent the rest of the day cutting this up and fitting it to the bottom of the bed he's making for the port aft cabin. Sue is still nursing her wounded wing in the apartment, enjoying the air conditioning and the (rather poor) WiFi. She's doing well, but doesn't want to risk her hand swelling up too much. 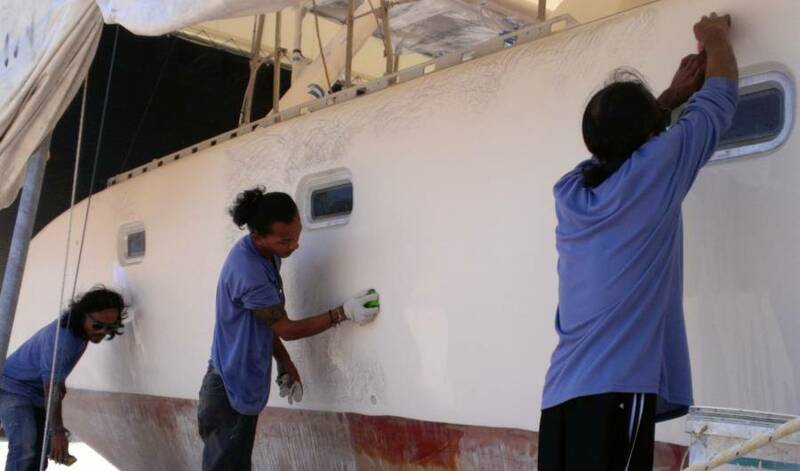 Jon and Amanda arrived at the boatyard to find Yoong, Nut, and Beng wet‑sanding the inside of port bow, while Baw, Pla, Lek and our new man Nai were wet‑sanding the outside of the port topsides. This ISO‑2500 gelcoat gets very hard, so apparently it's good to get at least a first sanding done soon. But they were out of 320 grit sandpaper, so Jon had to run out to buy more. Unfortunately, our local shop only had 14 sheets left, so Jon had to supplement with 360. Amanda attacked the mast, using the coarser pad to get the corrosion out. By noon she'd finished the whole port side of the mast except for some narrow strips just next to the sail‑track. Jon started working on the starboard side trampoline supports, grinding the holes we'd drilled earlier into rough slots, and then using Houa's sanding tube to smooth the edges and to get uniform slots. By lunchtime he'd trimmed back the blue PVC with a razor blade and was ready to hand‑sand the slots. We'd told Baw that sanding the (relatively easy) topsides was fine for the morning, but the guys should really sand under the bridge‑deck before it got too hard. Nobody wanted to sand there, as it meant working over their heads. They also complained that they'd get soaking wet and they didn't have other clothes to change into. But Baw and Pla went under and dry‑sanded with orbital sanders. Baw wanted an air‑powered sander (which can be used with water) but Golf managed to swipe his back before we could lock it away, and new ones are almost $250. Baw said he'd look into rental prices on Monday. Houa was building and mounting our engine‑room insulation under the bed that's going into the port aft cabin. From the plywood bed (and working down towards the engine) we're starting with a sheet of 4mm rubber, then a sheet of 1" (25mm) closed cell foam, then a sheet of 2mm rubber, and finally a 1" (25mm) sheet of lighter foam with bigger bubbles and foil on both sides. We're hoping that this insulates against both heat and sound. We wanted several materials with different absorption and reflection characteristics, but other than that it's not very scientific, as we're having to work with what we can find. In the afternoon, Jon had the delightful experience of being chased by his daughter ... very slowly, down the mast. We each armed ourselves with grinders and polishing pads. We had to work close to each other as we were sharing a power cord, but we didn't want to work too close or we'd be spitting dust at each other. So we started on opposite sides of the mast, about 3' apart, and worked down the mast, each polishing the half closest to us. By the end of the day we'd done almost a quarter of that side of the mast! A couple more of those and we'll be ready for final sanding and applying the Nyalic. After that the fun stuff starts, as we pull the wires up the mast and then re‑rig the diamonds using high‑tech Dynex Dux, a heat‑treated Dyneema rope that's stronger and much lighter than steel.